There are 109 files totaling 27210KB in this category. Lists various acids, giving you the name based on the chemical formula and vice versa. Given the right ascension (α) and declination (δ) of two stars of the same epoch (J2000.0 is the most current), calculates the distance between the stars. Formulas for calculating areas and volumes. 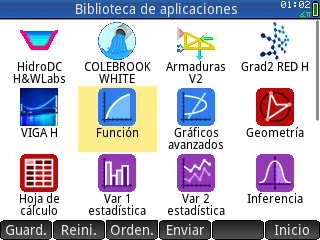 Astronomy program with many built-in features. For firmware 10077 or higher. Determines some physical and thermodynamic properties of air at different altitudes. Uses the international units system (SI) and considers dry air. 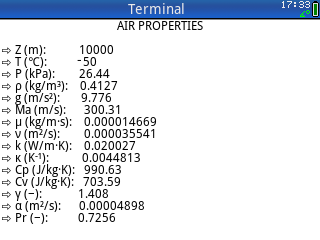 Altitude range permitted is from -5,000 to 20,000 meters; in this range air is considered ideal gas. 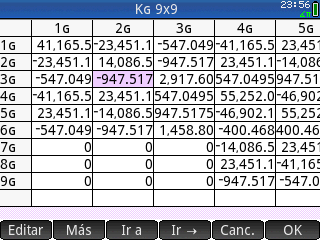 Based on 2-point coordinates, calculates azimuth and distance. Retrieves data about our solar system planets, including our dwarf planet, Pluto, presenting you with a choose menu which will present a screen of all the data for a planet. 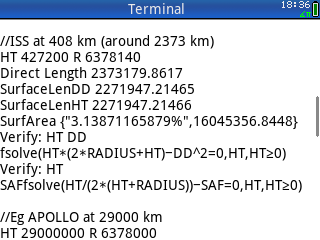 It also has a routine to pull out a specific data point for calculations. Data available are name, radius (km), mass (kg), gravity (m/s^2), density (g/cm^3), axial tilt (°), period (days), and number of moons. Given the mass (either in kg or solar masses), this program can estimate these black hole characteristics: Swartzchild radius, life time left as the black hole slowly radiates, average temperature of the black hole, surface area of the black hole, and surface gravity of the black hole. Performs soil calculations by the Terzagui and Beer methods. 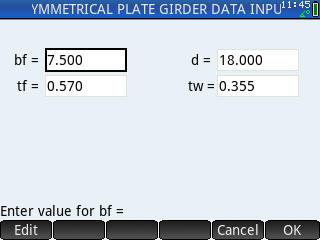 Calculates the General Method break and soil site for isolated rectangular, square and circular foundations. Takes power in horsepower (hp), mass in pounds (lb), initial velocity (mph), and time to evaluate (seconds). Returns zip (numerical value only (ft/s^1.5)), acceleration in miles per hour per second, velocity in miles per hour, and position in feet. Calculates the center of mass of the matrix M, where M represents the body. The entries of M represents an array of molecules, each with assigned weights. It is possible that the center of mass is located outside of the body. If gravity affects the particles equally, then the center of mass & center of gravity are identical. Calculates the slenderness and the column stability factor of a Douglas-Fir wood column. 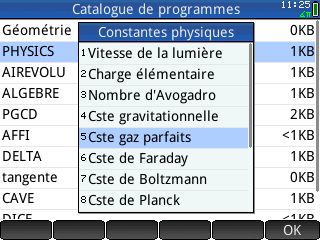 Common physical constants by Mickaël Nicotera and translated to English. Copy and paste text directly into a new program that you create. Calculates the support moments of a continuous beam having different moments of inertia (Mb for a two-field span, Mb and Mc for a three-field beam). Several load cases for the same beam can be performed. Accepted are trapezoidal- and point loads, split in dead- and live load. Used to study the frequency domain response of control systems consisting of a process and a controller. Open loop response with and without controller and resulting closed loop response (unity feedback loop) can be determined / compared. 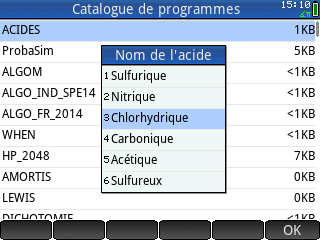 The app takes as input the transfer function of a process as well as the settings of a (PID) controller. It includes a ‘Bode plot’ which combines magnitude and phase plots on the same screen, indicating real frequency (log scale) and magnitude (log or dB scale) values, and not the logarithm of these values, although logarithmic scales are used. This Bode plot does not rely on the built in HP Prime plot mechanism but is programmed from scratch, including mouse movement and key press detection and custom soft key menus to accomplish functionality that would not be possible otherwise. The app also draws Nyquist and Nichols plots. Includes PDF documentation. Given the wire number, this program returns the diameter of the wire in inches. 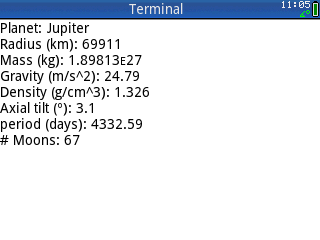 Calculates the distance a planet (and dwarf planet Pluto) is from the sun and the speed of the planet, given at any given the number of Earth days (and partial Earth days) from the perihelion. A planet is at its perihelion is when the planet is closest to the Sun in its elliptical orbit. Earth is at its perihelion approximately January 3 to January 5 annually. Finds for a date given as yyyy.mmdd the next dates for full moon and new moon and checks for the occurence of a lunar and/or solar eclipse. If positive, some characteristics like kind of eclipse, magnitude and size of shadow in Earth radii ( E.R. ) are calculated. Calculates the curvature correction due to the Earth, the horizontal distance from observer to reflector at both elevation of the observer and at sea level, and the change of in elevation from observer to reflector, given the slope distance between observer to reflector, the height of both the observer and reflector’s instruments, the elevation the observer, and the zenith angle: angle from directly above to the slope distance line. Electrical and electronic circuit solver that solves AC or DC circuits with linear and non-linear elements. 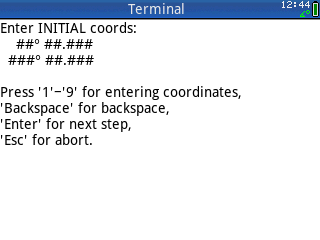 The program implements a full graphic interface to edit circuits, with useful functionality such as copy/paste, undo/redo, moving and rotation of parts, etc. It can solve both AC and DC circuits with both linear and non-linear elements. The non-linear elements supported include: BJTs, MOSFETS, diodes, LEDs, and zeners. 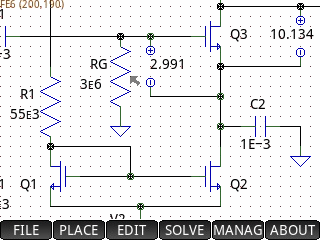 The results of the solution are displayed in the circuit editor itself. 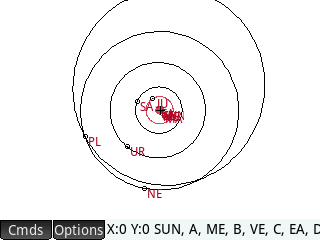 Astronomy program that calculates ephemeris for Sun, Moon and planets, transit, sidereal time, nutation and obliquity, Julian date, ascendant and many others data. Best used with Astro Lab. For use with firmware 10077 or higher. Equation of time approximation. The equation of time describes the difference in time (seconds, minutes, or hours) between the true solar time and time as we normally know it (a day takes 24 hours). If we used a sundial to measure time and compare it against a mechanical watch, the equation of time would demonstrate the approximate difference. 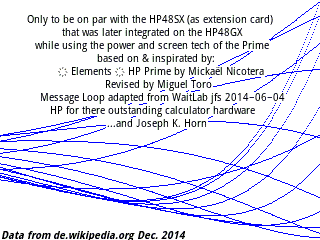 Offers 47 equations for HP Prime's Solver App. 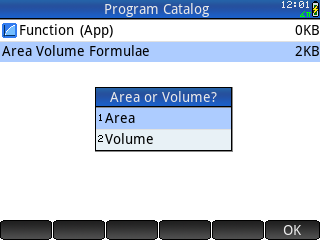 Just run the eqlib program, select the category that you are interested in, and select the equation within that category and you are off and running. Categories include: Geometry (areas, volumes, surface areas), Finance (monthly loans, sales tax, break-even), Temperature Conversion (Fahrenheit to and from Celsius), Physics: Problems of Motion (linear distance, circular motion, pendulums, terminal & escape velocity), Sound (speed of sound, Doppler effect, loudness), Optics (Lens and Snell equations, spherical refraction), Electronics (2 resistors series and parallel, thermal noise, Ohm's Law), Astronomy (parallax, luminosity, Kepler's 3rd Law, time dilation), Great Circle Calculations, Angle of Incidence Calculations, Gases (Ideal and Boyle's Gas Laws, heat capacity, air density, isothermal expansion), and Fluids (depth pressure, fluid flow, Bernoulli's Equation). Finds for the differential equation of a forced vibration given as m*d2y/dt2 + d*dy/dt + c*y = 0*cos(omega*t) or m*d2y/dt2 + d*dy/dt + c*y = 0*sin(omega*t) or a combination of both the exact solution dependent on preset initial conditions t0, y0(t0), y'0(t0). Calculates the upward forces of the truss's pin and roller. The program allows for any number of beams (minimum of 1), however, all the beams have the same mass. The lengths between the pin, the beams, and the roller can vary. 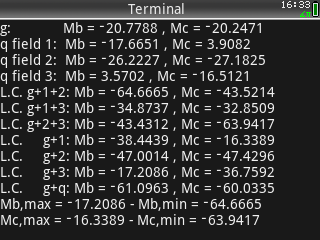 This program finds the formula mass (in grams/mole) of any chemical compound typed into the calculator using standard symbolic notation for elements (e.g. "H", "Ca", "O", etc.). Finds by means of successive calculation the member forces S and their components Sx, Sy, Sz in a 2D- or 3D-truss. 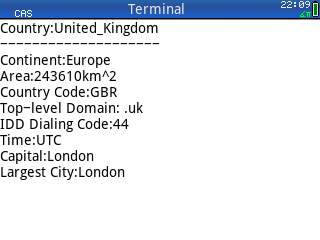 A collection of useful geodesy routines. Not for navigational use (estimated 14% error). 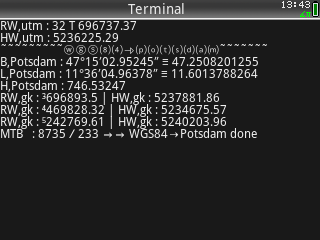 Converts between coordinates (UTM, sexagesimal or decimal degrees) of the WGS84 system to the corresponding coordinates (GAUSS-KRÜGER or degrees) in the POTSDAM system and vice versa, and finds the number of the German "Messtischblatt" including the marking of the 1/16 quadrant. 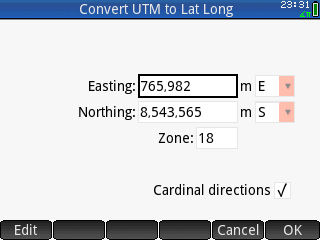 Converts UTM coordinates to geodetic coordinates and vice versa. 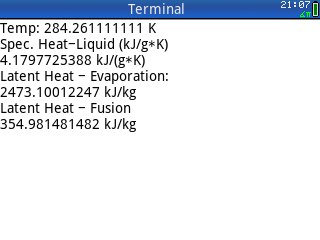 Calculates three heat properties of liquid water based on its temperature: specific heat capacity of water (ratio of heat added or removed from an object to cause a temperature change), measured in J/(g*°C), latent heat of evaporation, measured in kJ/kg, and latent heat of fusion, measured in kJ/kg. The program accepts three measurements for liquid water, Fahrenheit (°F), Celsius (°C), or Kelvin (K). This program calculates the torsional vibration of non-uniform free-free shafts by the Transfer Matrix Method according to the Holzer formulation. As a result the program delivers the natural frequencies and the corresponding normal modes together with the torsion moments distributions. The natural frequencies are determined using the bisection method for zeroes of functions calculation, so a searching interval is required. Implements simple geometric solutions for spheres, taking no account of refraction. It includes functions for distance to horizon at a given height, and inverse functions. Two functions to calculate the total impedance of the circuit, and its magnitude in ohms, the phase angle in a circuit in degrees, and the current of the series in amps, one for series circuits and the other for parallel circuits. A Solve library for solving Kinematics problems. It contains the four main equations. 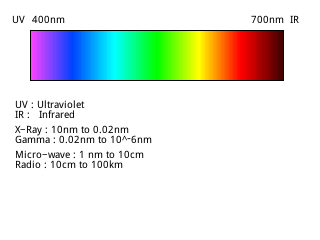 Diagram of the spectrum of visible light. Set of four spreadsheets to do calculations on Articulated Structures, Reticulated Structures with rigid nodes, Structures Mixed, with nodes rigid and articulated, and Gratings when the forces are applied perpendicular to the beams, such as decks. Each spreadsheet calculates the stiffness matrix of the beams, the translation and rotation matrix, and you can assembly the stiffness matrix of the structure. A set of mechanical engineering programs to calculate the cross section area of a cylinder, the maximum bending moment on a cylinder at yield, the collapse pressure on a 75/80/110 KSI yield pipe, von Misses stress, yield pressure, shear area and bearing area on acme threads, gross margin when cost and price are known, price when cost and gross margin are known, and future value when present value, interest per year, and period in year are known. 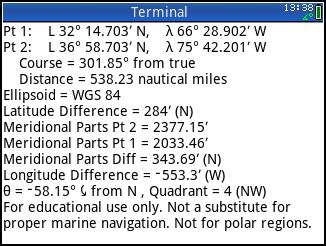 Calculates the course direction and distance in miles given two pairs of latitude (north/south) and longitude (east/west). 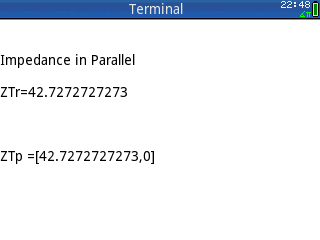 Calculates the course direction and distance in miles given two pairs of latitude (north/south) and longitude (east/west). Conversion to arc minutes will be required during calculation. Program to calculate moments of inertia, and also demonstrates the use of CHOOSE and CASE. Determines when the next start point of a desired phase of the Earth's moon will occur given a month and year. 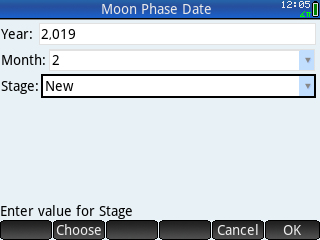 Calculates the decimal percent of the phase of the moon for a given date. 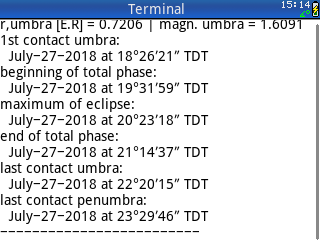 Calculates moon phase for a given date and then displays it adding some random speckles. Detailed instructions on how to install and use in English and Spanish. 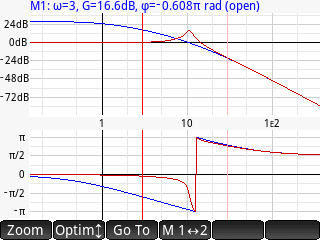 Given system temperature (in Kelvins), the first program calculates the noise figure (in Decibels), which describes the noise performance of an amplifier. The noise figure is described as the difference between the noise output of an actual receiver to an ideal, noiseless receiver. A noiseless receiver is said to have a resistor operating at room temperature, 290 K (about 16.85°C or 62.33°F). The lower the noise figure, the better. Given the noise bandwidth (in Hertz) and the resistance (in Ω), the second program calculates the open-circuit voltage (in RMS volts). 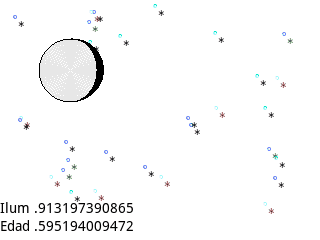 Attempts to parse the observatories file from the Minor Planets Centre and map their locations. Calculates the normal depth of a parabolic channel in the form of y = Cx^2, where C is the x^2 coefficient or curvature coefficient. The channel depth and width or any other known depth and width must be entered to describe the curvature of the parabola. Enter any three of the four variables (flow rate, depth, slope, and n) and solve for the fourth variable. The wetted perimeter P is calculated using the exact formula per Chow as redefined by Merkley. Includes comprehensive PDF documentation. Given the radius vector, velocity vector, and canonical units, produces the angular momentum vector, the node vector, inclination angle of the satellite, and longitude angle. 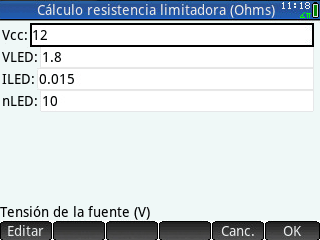 Calculates the parallel combination of resistors. Takes as input a list of resistors and outputs the equivalent resistance. 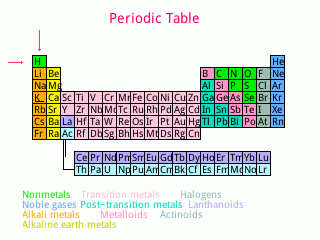 A simple keyboard-controlled periodic table of the elements. PDF documentation. 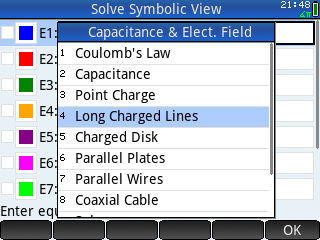 A large menu driven system with many formulas and diagrams for physics and electronics, including Karnaugh maps, resistor calculations, Zener diodes, and more. 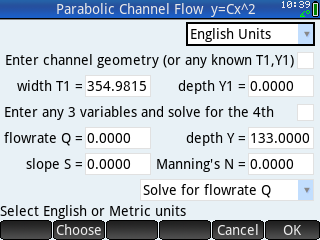 Calculate N, Q, S, Dia, or y/D for partially full pipes using Manning's Equation in English or Metric units. 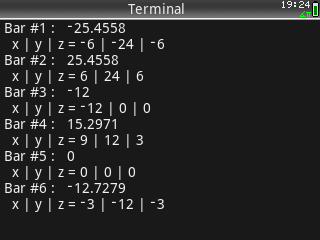 The program also computes the corresponding velocity. The depth of flow ratio, y/D, is solved by numerical analysis using the secant method. 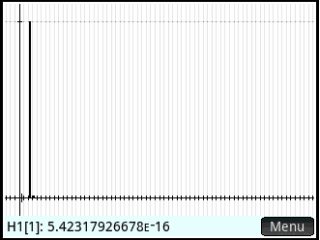 Where there are two solutions, only the first solution between 0 < y/D < 0.9381 is reported. When solving for the diameter, the calculated diameter and diameter rounded to a standard size are given. This program is a conversion of an old FORTRAN program that was printed in Schaum’s Solved Problems in Fluid Mechanics & Hydraulics, 1989. Computes the positions of the planets, plus one dwarf planet. 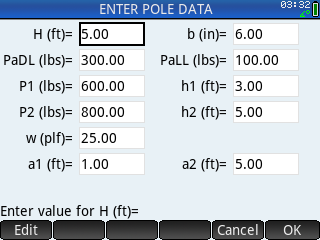 Demo version of a program to perform calculations to determine the required embedment depth for free standing poles embedded in earth or concrete which are subjected to lateral and axial loading conditions. Both laterally constrained and unconstrained conditions can be analyzed, as well as isolated and non-isolated poles. The User inputs the physical characteristics of the pole, soil properties and lateral and axial loads and the program calculates required pole embedment depth. The program will analyze both round and rectangular shaped poles, multiple concentrated and full or partially distributed uniform lateral loads located at User specified points above the pole base. The User can also specify if the lateral loads are due to seismic or wind. 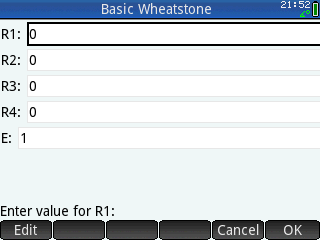 Up to two additional axial loads can also be specified. In this demo version, only one lateral load can be specified, and allowable lateral soil bearing pressure is set to 100 psf/ft. Finds for any polygonal cross-section with gaps of circle areas the main section properties, draws the plot of the contour and computes for any load combination of N, My, Mz the stresses in all input points. 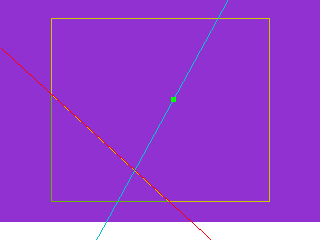 Furthermore the intersection points of neutral axis ( Sigma = ) and contour of the polygon are calculated. Calculates parallel resistance accurately, avoiding catastrophic accumulation of roundoff errors in all but pathological cases (e.g. many large numbers). It's so simple that it can be entered as a user function. A compressability factor, residual entropy and residual enthalpy calculator using the Leee Kesler method. Calculates on the basis of Eurocode 2 the tension reinforcement and, if required, the reinforcement in the compression zone of a concrete beam with given geometry, quality of concrete and loads M,Ed and N,Ed. Afterwards the calculation for a shear force V,Ed is performed. Documentation in German. 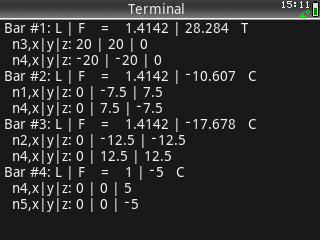 Calculates the current limiting resistor for a given number of LED diodes in series. 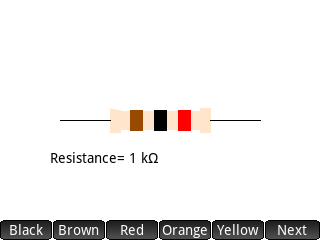 Enter the colors of a resistor, and the resistance is calculated. Calculates the condensed stiffness matrix and the general matrix for a typical framing system, assuming all elements are fully flexible. 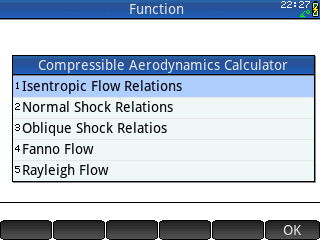 Calculates the global stiffness matrix of a system whose elements are completely flexible. 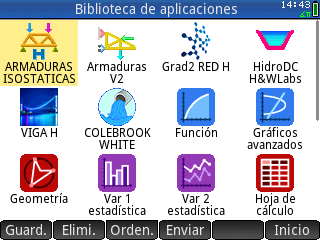 Demo version of a program that performs calculations to determine the structural properties of typical shapes. The user inputs the physical dimensions for a selected shape and the program calculates the following properties for both the X-X and Y-Y orthogonal axes: Area, Centroid Depth, Moment of Inertia, Elastic Section Modulus, Plastic Section Modulus, Radius of Gyration, Torsional Constant and Shape Factor. Analyzes I-Shaped, Solid Rectangular and Circular and Solid Rectangular and Circular Tube sections. The paid version of the program adds Angle, Built-Up Girder with Web and Flange Plates, Channel, Symmetrical I-Shaped Girder, Unsymmetrical I-Shaped Girder, Solid Rectangle, Solid Round Bar, Rectangular Tube (HSS), Circular Tube (HSS), Tee and Zee Sections. 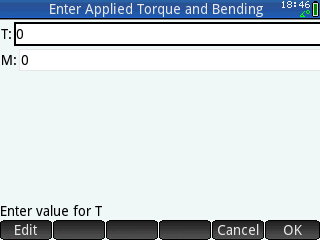 LT Version will analyze I-Shaped, Solid Rectangular and Circular and Solid Rectangular and Circular Tube sections. Various separate programs to perform some engineering calculations, for Strength of Materials, including Second Moment of Inertia, Common Dimensions, Complex Stress Systems Calculation, Equivalent Torque and Moment, Moment Calculation, Rosettes, Thinwalled Pressure Vessel, and more. Calculates for a single-span girder with any number of sections and elastic restraints or external moments at the supports the support reactions, end moments and maximum field moment including its location. Each section may have a trapezoidal load and a point load at the right end. Furthermore the shear force and the internal moment for any point of the beam can be calculated. 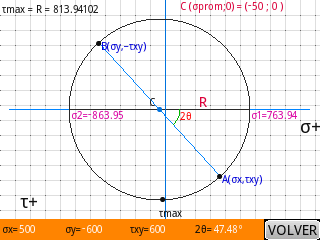 Displays a Smith chart and if you tap a point will display many of the relevant data about that point, including Z, X, Gamma, Return Loss, VSWR and Q.
Computes for a rectangular foundation submitted to vertical loads N and moments My and Mz the soil pressure for all points of the contour in consideration of a open gap (no tension possible in the gap). The automatic consideration of the own weight is provided. A plot of the area of pressure is depicted after calculation. Calculates two properties: the solar angle of incidence given the angular elevation and azimuth (from south going “counterclockwise”: east-north-west) of both the sun and panel, and the irradiance given by the solar panel. 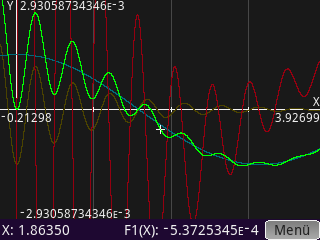 Does spectrum analysis using a Fourier transform. 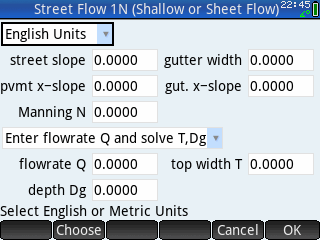 Calculates the depth of flow in a composite gutter section using Manning’s equation modified for shallow or sheet flow using the HEC 22 (August 2013) equation that describes Q in terms of Sx, S, and T and not the equivalent equation that described Q in terms of Z, S, and d. Program assumes: (1) the curb face is vertical, (2) friction on the curb face is ignored, and (3) flow is contained in the street and gutter section, even if the water depth is above the height of the curb. 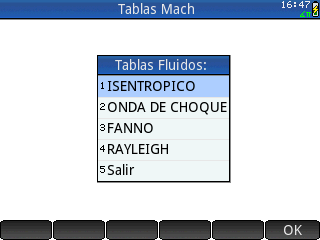 Tables for Isentropic Flow, Shockwaves, Fanno Flow and Rayleigh Flow, given the Mach number. Includes PDF documentation. Solves the simplified Bishop Method for slopes, with n layers, with or without water table and with or without tension gash. 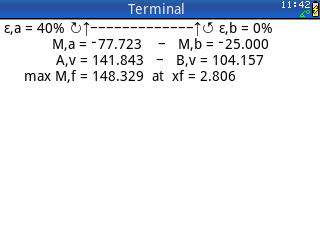 Calculates the RMS (root-mean-square) voltage of a resistor at a certain temperature. Thermal noise, also known as Johnson-Nyquist Noise is generated when the resistor has a temperature above absolute zero. It also calculates the noise power in decibels. 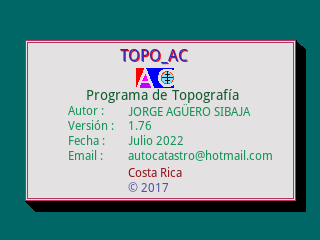 Program for topographic calculation with tools of data collector, calculation of coordinates, areas, courses, intersections, plotting, generation of DXF, import and export of points, and more. 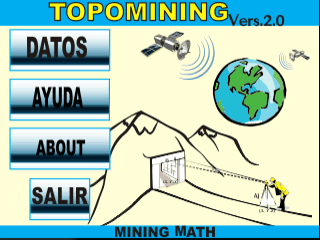 Several mining math tools for calculating topography, including the 2D planimetric method (entering the initial and final coordinates in 2D, or the initial coordinate and azimuth and distance) and the 3D tachimetric method (for the azimuth, course, vertical angle, horizontal angle, real distance, and slope, or the absolute coordinates, vertical distance, horizontal distance, and vertical angle). 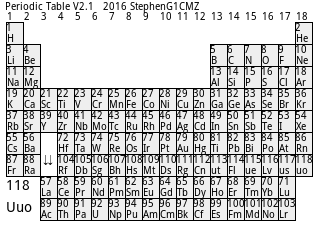 A comprehensive touch-controlled periodic table of the elements with details about each element and plotting of details. PDF documentation. An improved version of an older version of Mickaël Nicotera's touchscreen periodic table of elements. Does not work with more recent ROM versions. Finds the longitudinal forces in a 2-dimensional- or 3-dimensional truss by means of solving the matrix of equations of equilibrium at the nodes for the entire system. Converts h-parameter matrices for the following configurations of two-port transistor networks: Common Base Transistor Configuration (CB), Common Emitter Transistor Configuration (CE), and Common Collector Transistor Configuration (CC). Choose two parameters among pressure, temperature, specific volume, enthalphy, entropy, and steam fraction, and get the others as a result. 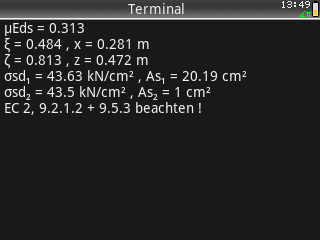 Test of a very basic part of an old GPS navigation applications, the Vincenty inverse solution, which calculates distances between points on the Earth with 1 mm precision. 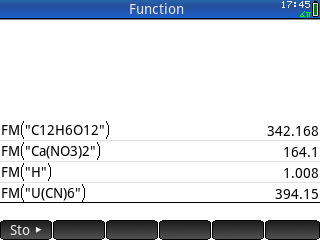 Provides water vapor tables, with a series of functions that take the temperature as input. Also provides a vapor temperature function to take the pressure and change it to the temperature. 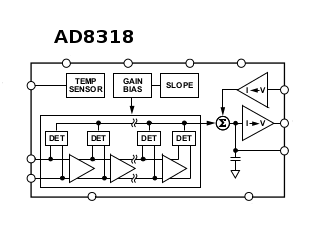 Calculates wattage given voltage for an AD8318 logarithmic detector. 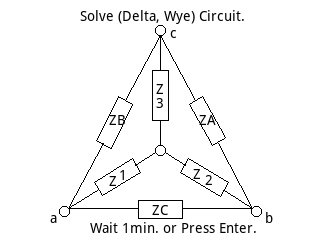 Does calculations for a Wheatstone bridge circuit. Given the four resistances and the input voltage, calculates the voltages in the middle and each side of the bridge. Four functions to convert wire sections between kcmil and mm², and between AWG and mm². A few astronomical routines, to estimate a planet's temperature, calculate drag on a spacecraft, and calculate magnitudes. 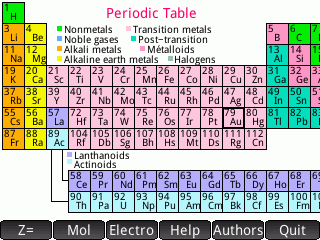 Displays a simple periodic table of elements. 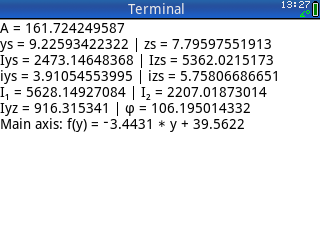 G1CMZ's Immensely Practical Package, containing programs to do things like calculate the distance of a thunderstorm. Uses Z LIGHTS and Z UNITS.